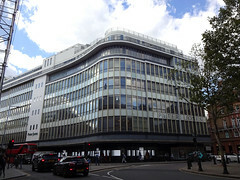 Large department store near Sloane Square Station, part of the John Lewis partnership. Along with all the other usual things (clothes, homewares, etc), it sells haberdashery, yarn, clothes fabrics, and furnishing fabrics. Last visited by Kake, September 2018. Opening hours taken from the John Lewis website, September 2018. Last edited 2018-09-10 06:20:40 (version 7; diff). List all versions. Page last edited 2018-09-10 06:20:40 (version 7).